Downtown Beloit ArtWalk is a unique, evening shopping experience in historic Downtown Beloit that transforms businesses into art galleries! There will be more than 25 venues and 30 artists participating. In addition to the vast array of unique items for sale, shoppers can enjoy live music and free trolley rides. 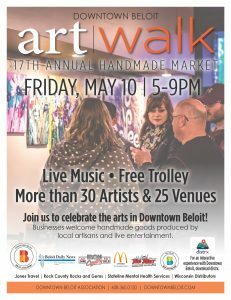 Brochures will be available listing the participating businesses and the names of the artists or craftspeople selling their wares in each location.